It's one of the words I hate most in this world: Skinny. Maybe, because it is something I've never personally been or experienced. In this world, there has always been a certain positivity that comes along with skinny and a negative stereotype if you are anything but. And before I get too far into my thoughts, please know that for anyone out there dealing with the opposite issue of having trouble gaining weight, I am certainly not dismissing or minimizing your struggle at all. I just want to shed some light on mine. Or, rather, allow me to ask ~ When did it become socially acceptable for people use backhanded compliments like, "You've lost so much weight!". Or, "You looked so much bigger on TV!". And my personal favorite (not), "How much weight have you lost lately?" This is all feedback I have received lately with having lost a noticeable amount of weight in recent months. When I get asked these rather poignant and personal questions, everything in me wants to crawl under a rock. I am left to wonder Why can't they just say, "You're looking great! ", or, "You look so strong". Even better yet, "Wow! I can tell you have been working really hard at the gym". These are the kind of comments regarding my body that I like to get. To hear these more positive affirmations on a person's fitness or health transformation is so much more rewarding. It is a compliment in the present, rather than reflection on one's past look or state. To be real, when it comes to talking about weight loss, I don't like it. The talking. Not the fitness part or seeing the numbers of the scale go down. My physical journey with fitness and body image has been clouded by emotional pain. Talking about it often re-opens age-old wounds. I realize, too, I'm not alone in feeling this way about my body. Body "issues" and its partner, self-esteem, are universal. Nearly everyone - woman, man, old, young, rich, poor - struggles with something about how physically fit or unfit they may be. I am no exception. Perhaps this came to light most when, at 19 years old, I stood under a spot-light on a world stage, competing on The Voice. Imagine this for one second. There you are, front and center, in front of not only some of the world's best musical talent and artists, but a large, and at times, rowdy, physical audience. Oh, and a television audience of millions. Millions. Like all the contestants, I received my fair share of feedback. And I'm not talking about on my voice, singing, or stage presence alone. While competing on Season 4 of The Voice, I caught some slack online about my physical appearance. It was tough to hear. Painful to read. It’s pretty radical how these “keyboard warriors” can see someone they don’t even know, and literally, in a matter of minutes, feel that they have the right to publicly and harshly criticize every little thing that doesn’t add up to their view of “normal”. For example, someone commented about my nostrils. My nostrils! And, I received comments about my size. It was these comments that perhaps stung the most - maybe because my then 19-year-old self was well aware that I was not the stereotypical Hollywood-size-zero or double zero (why is that even a thing?!). In addition, as I saw myself on television, in magazine layouts, and in promotional photographs, I too, was critical of what I saw. It was my own dissatisfaction with my body that affected me the most. In fact, in 2011, the way I looked at my physical appearance triggered a new and powerful internal dialogue. Holly, you have to love you. All of you. And if you want to change it, you're the only one who can do it. It has to come from within you. I think this is a pretty powerful mantra. Love you. All of you. And if you want to change it, you're the only one who can do so. It has to come from within. Right then and there, critiquing my performances on The Voice, I knew I needed to do better. I wanted to do better. Let me be clear, however, what "better" was. Or rather, wasn't. Better to me, was not skinny. Better to me, was not starving myself and spending insane hours on a treadmill. Better, to me, meant stronger. More than anything I wanted to see, feel, and be a stronger Holly. Strength is what I have always had in my voice and in my music. Now, I had a new desire for my body to compliment that. So, at age 21, roughly a year after competing on The Voice, I hired my first-ever personal trainer. Free Weights! The sight of these used to frighten me. Now, these weights both excite and challenge me! And boy was this physical trainer in for a challenge! I didn't know jack about physical fitness. I had played a few sports, as a kid. And, at the current time I was marching in Baylor's band. But when my trainer initially mentioned the words strength training, my first reaction was like, Nah uh. No, thank you. And heck no. I had always associated lifting heavy weights more fitting for a guy. And I didn't want to look like a man. However, my initial trainer, Mr. Eddie Lackey, a former Baylor linebacker, had what we southerners call a “come to Jesus meeting" with me. Through kind and encouraging explanation and example, Eddie educated me on the myths associated with lifting weights and strength training. And with this, he encouraged me to jump right in. Not only did I jump (and squat) in with weight and strength training. I fell - in love. Trust me when I say, there is something about lifting a bar with weights until your legs turn to jelly and you can barely move that fuels some serious empowerment. Nearly five years after I learned how to lift, balance, squat, and more, I am still in love with what has become a consistent part of my life and music career. In fact, I might even have become a gym junkie! Now, don't get me wrong. It most definitely isn't always easy. It can be difficult for most of us to maintain and build upon a disciplined fitness routine. This is certainly true for music artists. Or, for those of us who travel often. 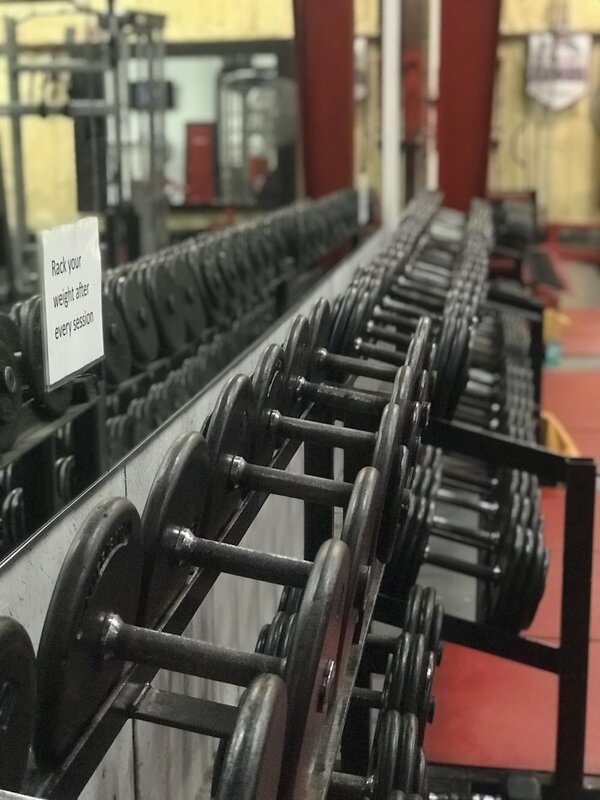 Finding a gym or manipulating ways to continue with my program while on my most recent tour, Steel, was particularly difficult. I was on the road. A lot. I ate out. A lot. More times than I would like to admit, I have fallen off the weight-lifting wagon. The good news - I have always climbed back on (it). In fact, since Steel began to wind down last December, I have been particularly good with my current and much-loved trainer, Kenneth Ford of HighPower Fitness. Kenneth makes our workouts fun (while killing me). We often pray together. And we hang out talking about life, after the workouts. Kenneth gets me. More importantly, he gets my body. He gets that building leg strength is a lot easier for me than arm strength. He gets that on days when I have to leave town for a gig or to work on my new music projects, I may have to skip, or rather - swap, a planned workout. Meet my current fitness trainer, Mr. Kenneth Ford of HighPower Fitness. Do not let this face fool you. He's a tough one, y'all. In addition to disciplined strength and weight training, I made the powerful decision to adopt a better nutrition plan! After all, trainers and nutrition coaches everywhere will tell you that losing weight is 80% nutrition and 20% fitness. My trainer's famous words often echo in my ear "You cannot out-work a bad diet". I realize, now, that what I put into my body impacts me more than what I do to it on the outside. That being said - I've learned a strong new personal belief: dieting alone without any sort of physical activity is not very beneficial. Don't get me wrong - you will drop pounds and lean out, but in the process, you aren't toning your muscles, and will likely end up with a softer or flabbier physique (some people call it skinny-fat). The bottom line? Diet and exercise still work best hand-in-hand. Not "new" news, I know. Over the past 4 years, different trainers have often advised me to take up a high protein, high veggies and fruit, low carb diet, which did work for me quite well along with lifting weights. I found, however, that it was especially hard to stick to this specific nutrition plan while I'm on the road traveling for music. Which over the last year, has been often. Y'all. There are so many food temptations surrounding me everywhere I look - billboards, TV, my phone - etc. And late at night, after a gig, when nothing is open except McDonalds, IHOP, Taco Bell and the gas station snack shop, it has been challenging to select healthier options that fall more within my nutrition goals. So, what's a country singer on the road to do? Keto is a lifestyle that I have a much easier time following. On the road, I take a snack bag with me of small grab-n'-go items such as string cheese, almonds, tuna packets, and Quest protein bars. I have educated myself on finding Keto options to eat at almost any restaurant we stop at. And yes, when I am home, I do cook! On the keto lifestyle plan I don't have to give up the things I love like pizza. I made a terrific Keto version that even my boyfriend and brother love to eat! In all, since my most recent climb back upon the fitness train, I am down about 25 pounds from where I was during the The Voice. That may not sound like much; however, I have greatly increased my muscle, and we all know that muscle weighs more than fat. So rather than look at the numbers on a scale, I am personally more comfortable with noticing how my clothes fit and feel, and of course, what I see in the mirror. Even more so, I feel more energized. Let’s be real, I will probably always be a carb-lovin’ Texas country girl. However, today, bread, sweets, and other loves don't always call out my name from across the kitchen. With that, I have found that my mood is often happier and my walk, just a little more confident. Have I reached my goals? A lot of them, yes. Unlike the period following The Voice when I didn't like what I saw on stage, I do now. I am stronger. I am leaner. Do I have new physical goals I want to reach? Absolutely! For example, I want to be able to do 20 pull-ups with ease! (You can bet I will post that video on my Facebook and Instagram pages when it happens!) Most important, however, with reaching these recent goals, is that I have found a sense of freedom when it comes to my body and the perceptions that surround it. And this kind of personal freedom feels good. Real good. I have found purpose and passion in taking care of my body and loving it for what it is, instead of hating it for what it isn’t. Man, that's powerful, isn't it?! This verse is poignant. Think about it. I have. In doing so, I now realize how incredibly thankful I am for my able body - My two feet that can take me anywhere I want to go. I am grateful for two legs that can run, walk, jump, skip, leap, lift, and more. I see my core as so much more than a stomach, now. It is the part that keeps me balanced and centered. I am thankful for my upper body that can push, pull, carry, and hold me up. I am thankful for muscles that are strong - yet beautiful. Beautifully strong. Yes. I do not take for granted a healthy heart that beats with life and compassion, a brain that can think and discover new things, hands to feel, give and work hard, and eyes to see and express emotion. These parts of me are gifts. When I see myself in a promotional photo, commercial, or video of me performing on stage, I no longer see a body with faults. I see a human with a shell that will always be a work in progress. But it works. It functions. It's hard to be down on oneself when these physical blessings are so visibly abundant. They are strengths. And we all have them. Yes? Yes! So if you pass me along the street in Waco or Dallas one day soon, or, if you're at one of my summer festivals, come over and say hello. Let me know how you're doing. And I'll do the same. And if you feel like handing out a compliment - a true and honest make-a-girl-feel-great-compliment, tell me how strong I look and sound. I guarantee, your thoughtful words will not only make my day, but encourage me to grow even stronger.